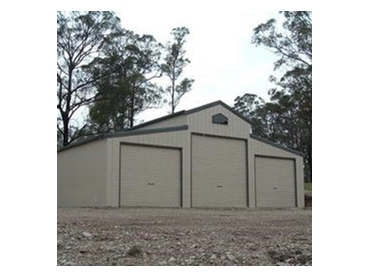 Farm and machinery sheds from Ozsteel Garages and Sheds are Australian designed farm and machinery sheds built to protect valuable machinery and produce from Australia's harsh climate and conditions. Ozsteel Garages and Sheds manufacture gable roof farm sheds among other farm and machinery shed designs. Unlike the traditional gable roof farm sheds which come with three sides clad and open on one gutter side or open on one gable end, the vast array of options available from Ozsteel Garages and Sheds ensure the company can provide a building for almost any requirement. site specific plans for throughout Australia. For those more unique sites and applications, Ozsteel Garages and Sheds also design and manufacture custom designed sheds. With their exclusive design software programme, Ozsteel Garages and Sheds' experienced staff can run through a series of options to quickly find the most efficient and economical custom design for any location.